Puree the tomatoes in a food processor until smooth, about a minute. In a soup pot, sauté onion and garlic in oil for 2 minutes. Add tomatoes, stock, sugar, salt & pepper and bring to a boil. Reduce heat, cover and simmer for 20 minutes. Note: For cream of tomato soup just add a teaspoon of whipping cream per serving. 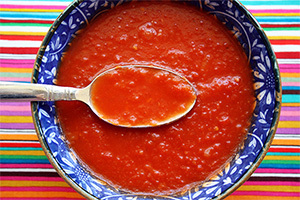 6 Comments on "Quick & Easy Tomato Soup"
I don’t like tomato soup. But I made this recipe. It is the best tomato soup I don’t like. Thank you for the quick response to my question. Happy to hear that using San Marzano crushed tomatoes is o.k. how it turned out. My hubby is crazy nuts for tomato soup! I can’t make enough of it. Thanks again Jenny for your speedy response. Jenny, can I use San Marzano’s crushed tomatoes for this soup? I make another tomato soup and use the San Marzano brand. great. Just wondering if Pomi would make a difference? My Grandma use to make them and they were out of site! She was Croation. They are good cooks too! waiting to hear from you and Thanks in advance. Yes, San Marzano tomatoes are the best so use them for this soup. In fact, I will add that idea to the recipe. I must have close to a hundred spatulas and can’t be sure where I got the ones in the photo, but I buy most of my colorful tools at either Sur La Table or Target.